Designed the automated control system for a storm water treatment plant. The treatment system was designed for storm water runoff flow rates of 600 GPM, and removes PCB’s from the water before discharging. The process included equalization, pH adjusts and coagulation treatement, inclined plate clarifier, filter press, and final filtration. 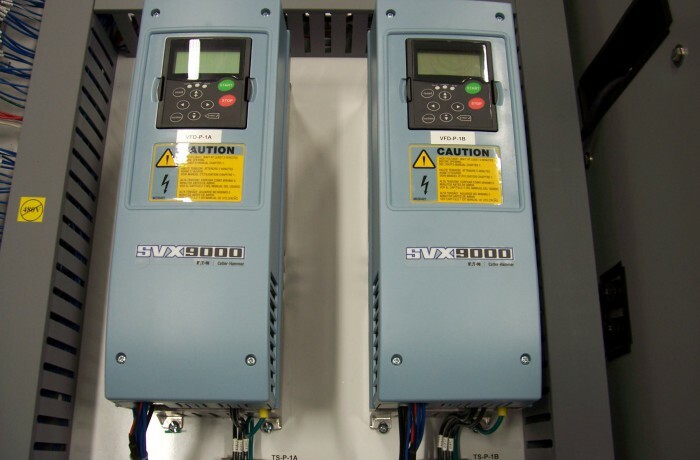 Controls included a PLC based processor with the required analog and digital I/O for the system devices and instrumentation. A color operator interface terminal with custom graphics was designed for operator control. The terminal provides the operator monitoring of tank levels, pump control and alarm status. The PLC and Operator Interface terminal communicate via an Ethernet backbone which allows remote data acquisition and off-site system monitoring. The system also includes telemetry communication for monitoring and control of a remote pump station. Our scope included providing all aspects of the automated control system for this project, including the PLC software design, operator terminal graphics, control panel fabrication, instrumentation, and system start-up support.